Full-page reprints of all Cover Bs by Kevin Eastman from TMNT (IDW) #1 thru TMNT (IDW) #26. IDW is notorious, NOTORIOUS, for their habit of glutting the market with variant covers. Dozens and dozens of variant covers like 1992 was making a comeback. It is insane. As an individual who doesn’t collect variant covers, however, I can’t say that its ever really bothered me. I know it ticks off fans who want to collect “one of everything”, but jeez, I cannot afford to be that kind of fan. But IDW’s a pretty cool group of dudes, so they’ve also begun releasing cover gallery collections priced the same as a regular issue. I’ve picked up a few of these for some of my other IDW subscriptions and it’s exactly the kind of system for a person like me. 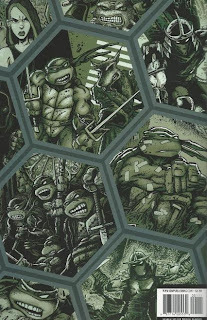 Alas, they don’t collect ALL the variant covers (this one is just themed around Eastman), but I can survive. 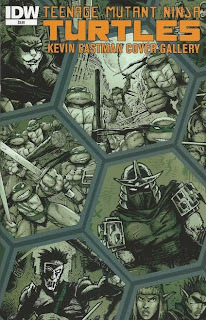 Nothing to grade; just thought I’d point this baby out since it might have slipped through the cracks with today’s two other TMNT releases. Looking over Eastman’s B covers chronologically, it’s funny to see how much more, well, INTERESTING they get as time goes by. For the first 4 or 5 issues, he really has nothing to say (partly because those issues were so decompressed and plot-less). Once the series began to actually develop characters and stories and unique set pieces, suddenly his covers become livelier and escalate beyond bland pinups of the Turtles mugging the camera in awkward poses. For those who want the variant covers but don’t want to bankrupt themselves actually buying them AS variant covers, then this collection should be your first stop.